Dr. David Ilan, Director of the Nelson Glueck School of Biblical Archaeology, announced the passing of Professor Avraham Biran. Jack Sasson reports to the academic community the passing of Prof. Avraham Biran. It is my sad duty to inform you that Prof. Avraham Biran passed away last night. He was one month shy of his 99th birthday. Avraham Biran, a third generation Israeli, received his Ph.D. at Johns Hopkins University under William Foxwell Albright and was Thayer Fellow in the American Schools of Oriental Research, Jerusalem, 1935-37. Formerly Director of the Israel Department of Antiquities and Museums, he served as Director of Hebrew Union College-Jewish Institute of Religion’s Nelson Glueck School of Biblical Archaeology in Jerusalem from 1974-2003. He participated in the excavations of the Uiversity of Pennsylvania in Iraq, at Tepe Gawra near Mosul, and at Hafaje near Baghdad. He accompanied Nelson Glueck in his epoch-making discoveries at the head of the Gulf of Eilat. 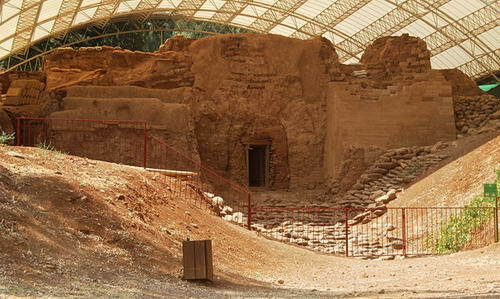 Professor Biran directed the excavations of Anathoth, Tel Zippor, Ira, Aroer, the synagogue of Yesud Hama’alah, and the longest ongoing excavations in Israel at Tel Dan (under his direction from 1966 to 1999). It was my pleasure on several occasions to hear Prof. Biran at professional meetings. I remember hearing him tell of the discovery of the House of David inscription. He always spoke with such enthusiasm; it was contagious. The last year I saw him at one of these annual meetings I was walking across the street from my hotel to the conference center. There was Prof. Biran. I spoke to him and more or less helped him across the street. The tremendous work done at Tel Dan seemed to me to be a testimony to his continuing work there. It takes a long time to do a lot of good things, especially archaeology. The significant discoveries at Dan are too numerous to mention just now. In 1979 a complete Middle Bronze city gate (19th/18th century B.C.) was found at Dan (ancient Laish). This gate illustrates that the city was strongly fortified at the time Abraham rescued Lot (Genesis 14:14). I made this photo of the preserved gate on August 31. The Middle Bronze age city gate at Dan. Photo by Ferrell Jenkins. This entry was posted in Archaeology, Israel, Old Testament and tagged Avraham Biran. Bookmark the permalink.